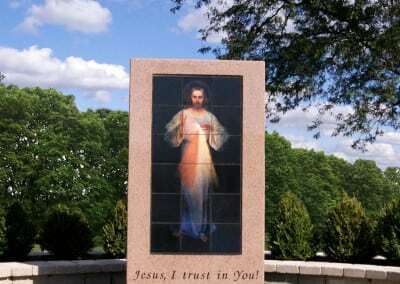 What are Religious and Sacred Arts? 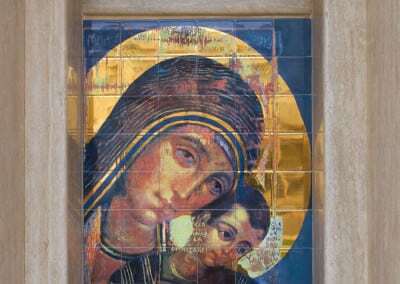 What are the values of Sacred Art made with tile? Durability, Quality, and Continuity. 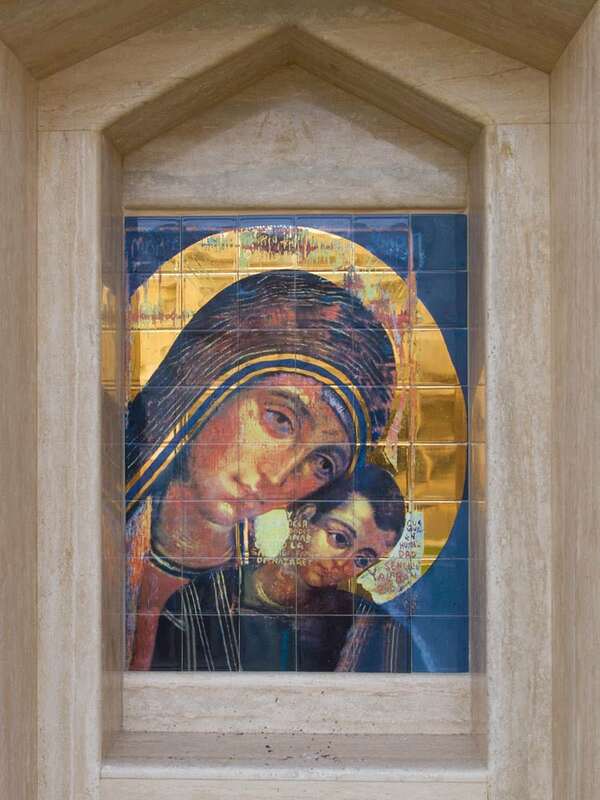 Since kiln fired ceramic tile and glass is very durable, sacred art produced using these materials will last thousands of years. 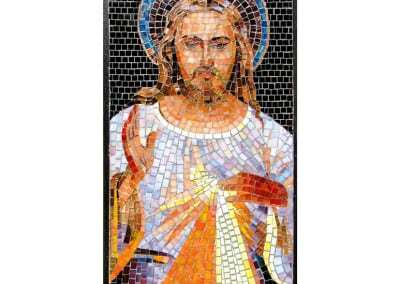 The quality of the imagery is very high whether made as kiln fired image transfer to porcelain tile, or as a hand-cut glass mosaic. 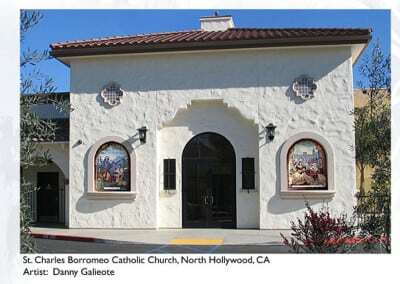 These methods offer a continuity of form in that these materials have a very long tradition in the sacred arts. 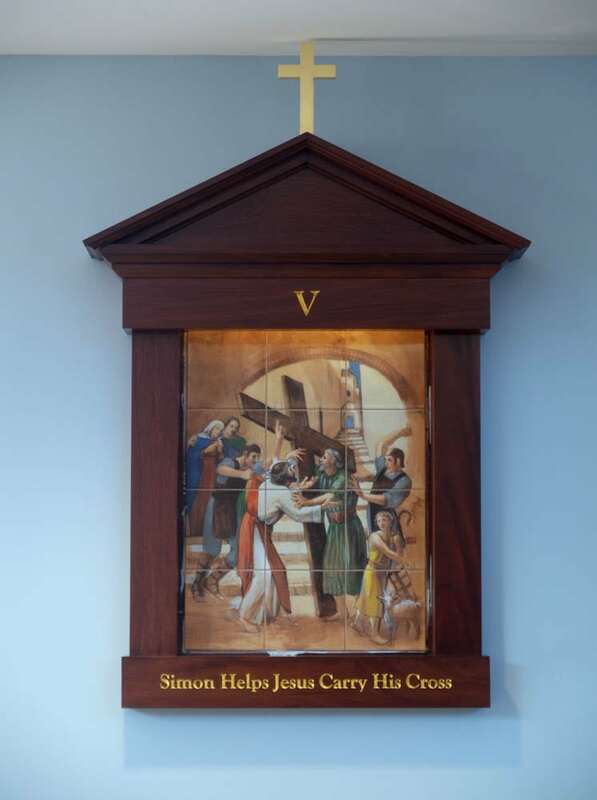 Where is Sacred Art used? 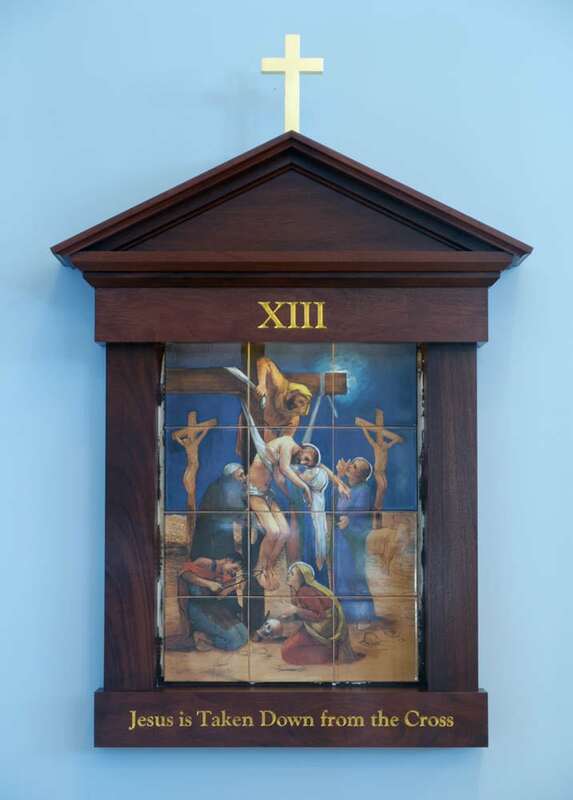 Sacred art is used inside and outside churches, temples, mosques, shrines, cemeteries, mausoleums, and columbaria. 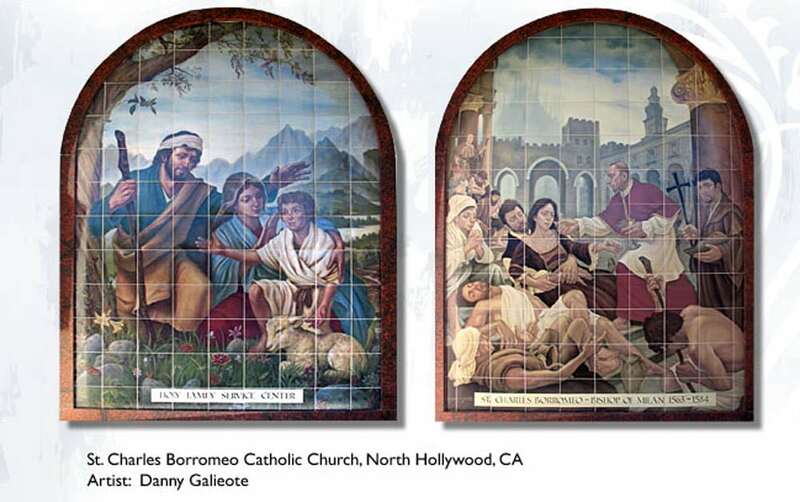 Indoors and outdoors, in all weather conditions, sacred art produced by Tile Artisans will resist UV rays and scratching. 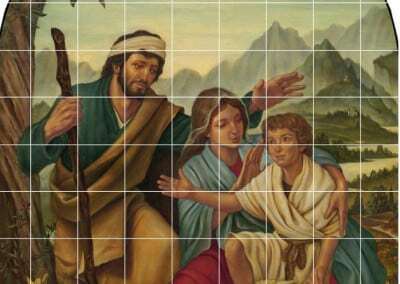 Even better, graffiti can be easily removed without harming the artwork. 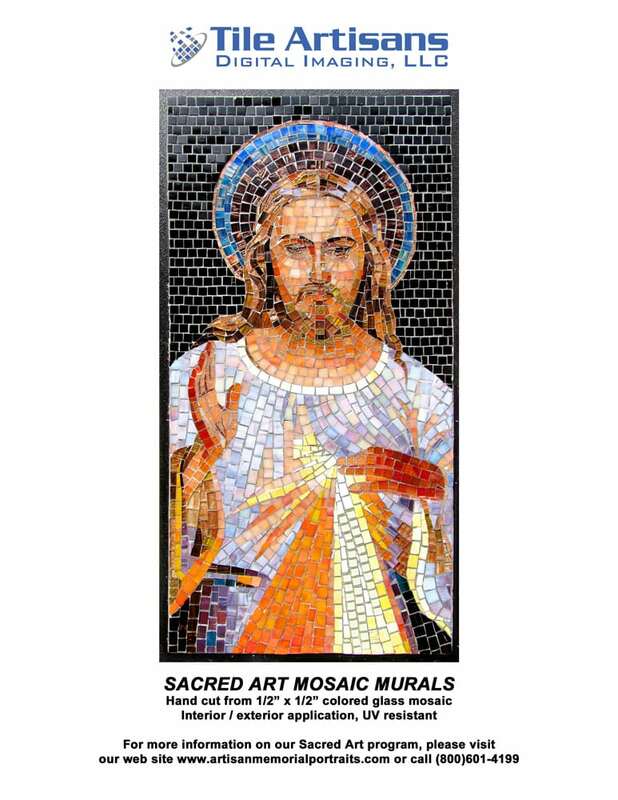 Sacred Art Tile Murals are sturdy, solid, and durable, providing the proper respect and reverence for the subject of your artwork. 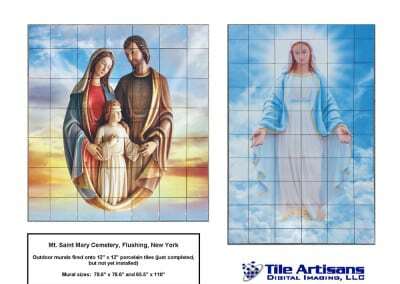 Tile Artisans mural tiles are kiln fired, which means our images do not fade from exposure to ultraviolet radiation, even with prolonged exposure. Our murals are made with the finest porcelain tile, ensuring that they are impervious to freeze-thaw cycling and impervious to harsh chemicals and scratching. 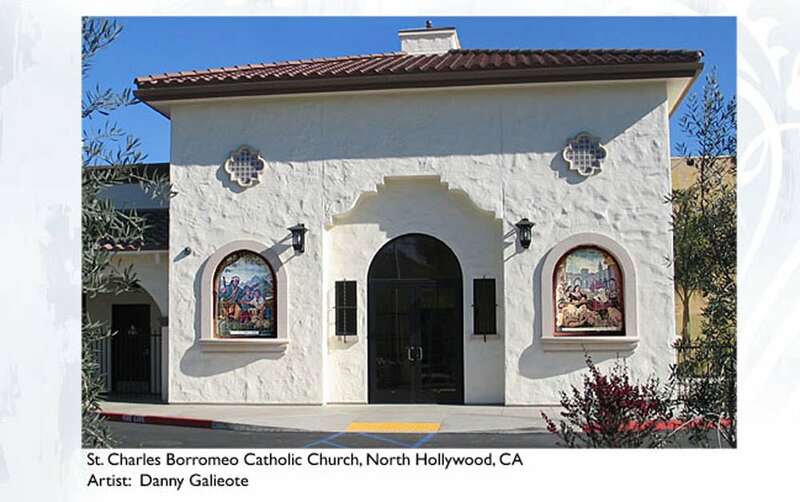 Vinyl, dye sublimation, and hand painted murals tend to peel, crack, and fade over time and are subject to permanent damage form outdoor weathering and graffiti. 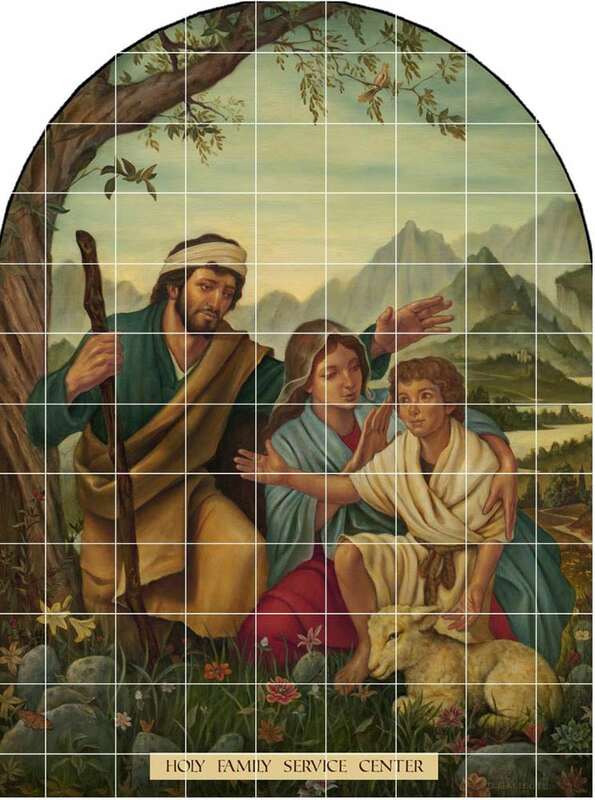 Tile Artisans kiln-fired mural tiles are the high quality alternative to other inferior products. Sacred Art Tile Murals tell the story of sacred events and provide decoration in a tradition that is thousands of years old. 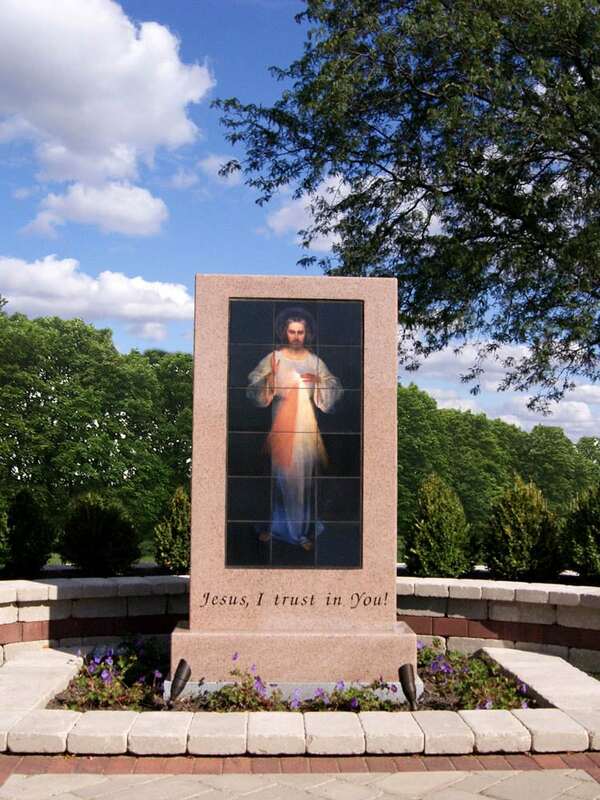 They commemorate the people and events that shaped our faith, honoring the extreme sacrifices and the work of extraordinary people in extraordinary times. 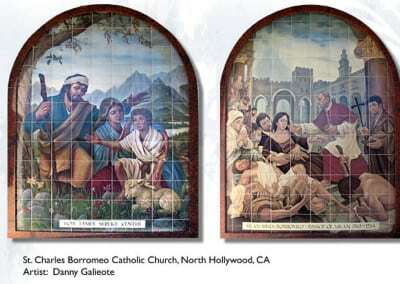 Sacred Art Tile Murals tell these stories in a format independent of written language, making their lessons accessible to all present cultures as well as innumerable generations to come. 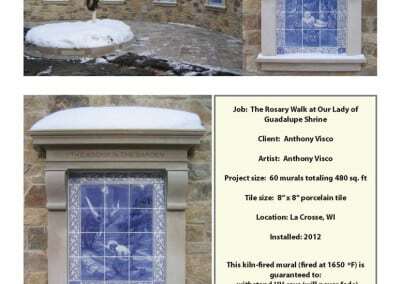 As part of the outdoor devotions the Shrine commissioned 20 images depicting the Mysteries of the Rosary to be done in porcelain tiles to withstand the harsh winter months in Wisconsin. The twenty original compositions depict the four sets of Mysteries, namely, the Joyous, the Luminous, the Sorrowful, and the Glorious. Within each set there are five individual mysteries or points of meditation to assist the devotees while praying the Holy Rosary. 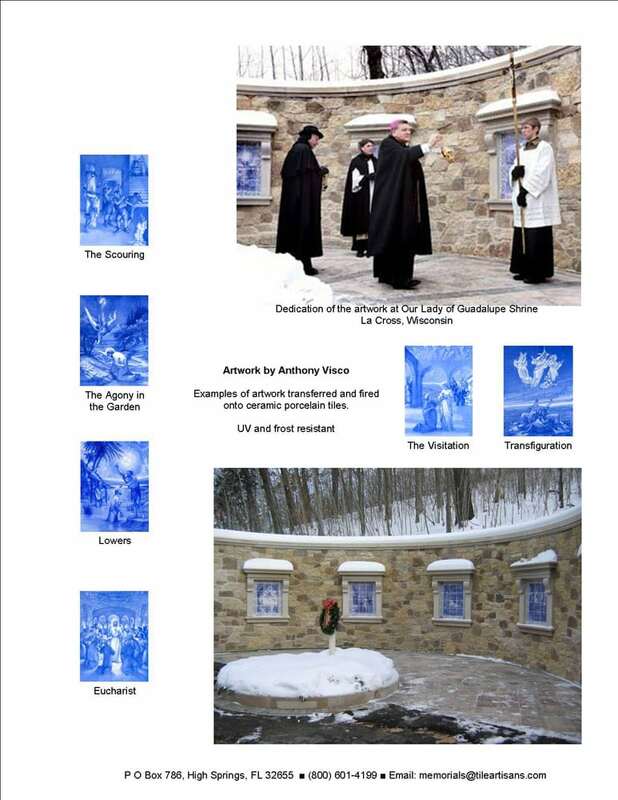 Each of the four sets of mysteries has its own hand built alcove of indigenous stone. 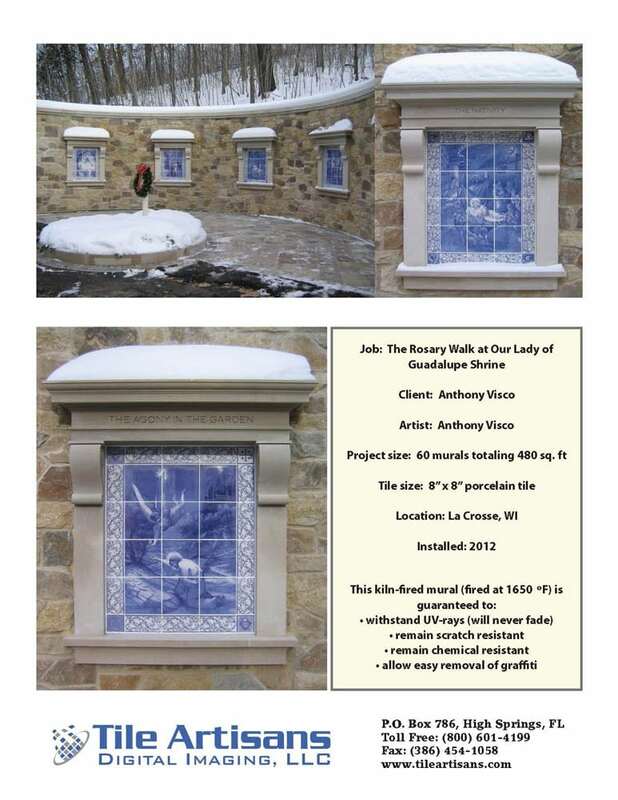 Each mystery is housed in its own limestone frame with its title above. 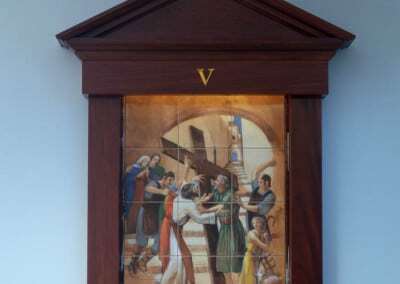 On the flanks of each alcove is a description of the Mysteries and the Hail Mary in several languages. 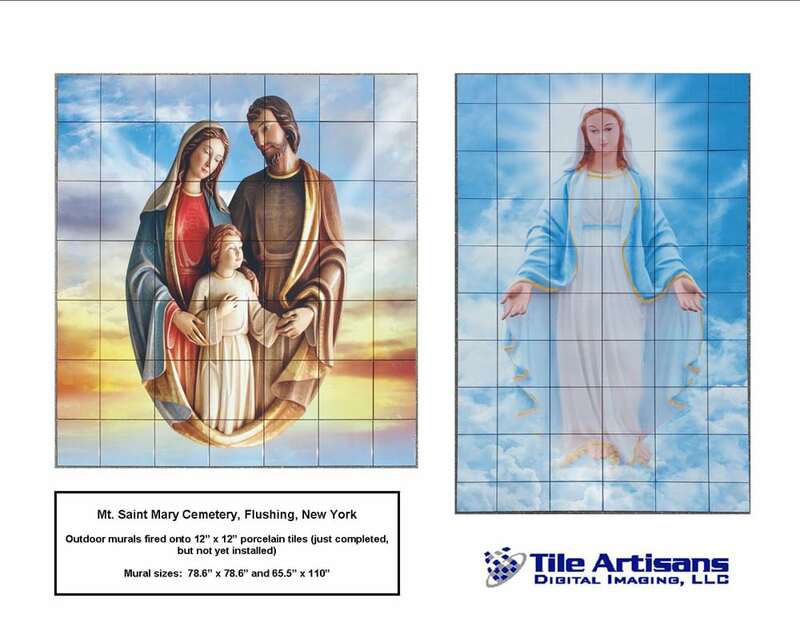 Tile Artisans has a commitment to providing the highest quality sacred art at reasonable prices. 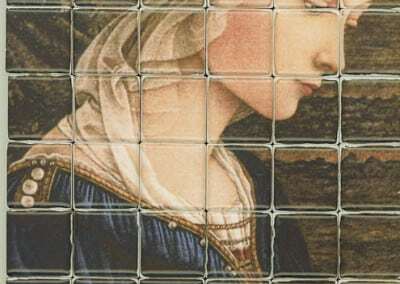 We use only the finest porcelain and a kiln-firing process for tile and the best glass and a hand-cutting process for mosaics. 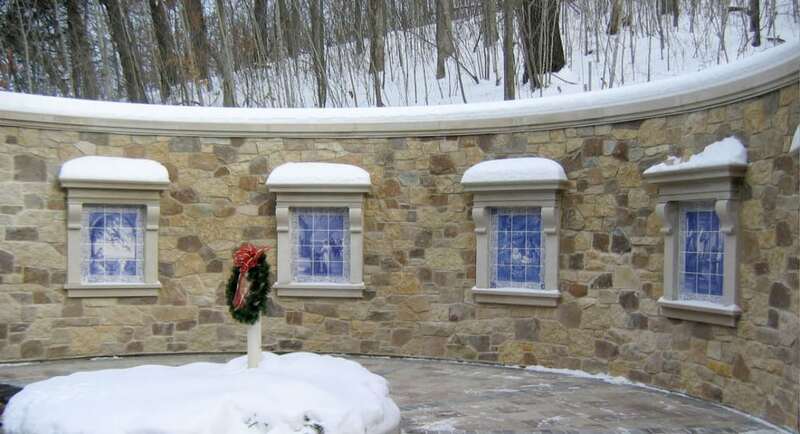 Our products are guaranteed for life; they are permanent, non-fading, and durable. 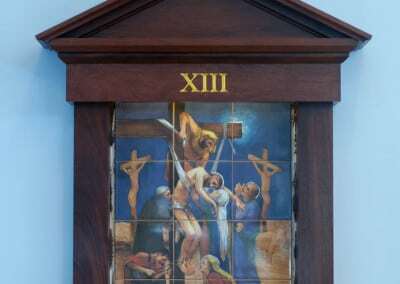 Tile Artisans works hand in hand with artists involved in sacred art projects. We speak your language, helping you every step of the way from the project concept phase to pre-installation advice.